Upon your arrival, our local guide will expect you outside the Arrival Hall of the airport and transfer you to the downtown hotel. The rest of the day is free for you to adapt yourself to the high altitude of 3,650 meters above sea level. With a glorious history of over 1,300 years, Lhasa, meaning “holy land” or “the sacred place of Buddhism”, has long been the political, cultural, economic and religious center of Tibet. Although Tibet is in the far west of China, visitors can easily travel from Hong Kong to Lhasa via Guangzhou, which offers excellent transport links. For your information, you can take a train with the duration of about two hours from Hong Kong Hung Hom Railway Station to Guangzhou East Railway Station. There are 12 pairs of trains running daily between the two cities. The first train Z812 leaves Hong Kong at 07:25 and the last one Z802 is at 20:01. If you have never been to Guangzhou, you can take the morning train so as to have some time to explore the city a bit, and then take flight CZ3463 0810/1405 (including one hour stopover in Chongqing) to Lhasa the next morning. For those who want to travel from Lhasa to Hong Kong after the Tibet exploration, you can take the flight 3U8658 0930/1135 to Chengdu and then connect the flight CA427 1610/1845 to Hong Kong intraday. Your one week Tibet tour starts from the Drepung Monastery, one of the six largest temples of the Gelug Sect of Tibetan Buddhism in China. The white buildings of Drepung Monastery scatter on the slope of the mountain, which looks like a huge pile of rice at a distance, hence the name 'Drepung', meaning a pile of rice in the local language. After having lunch, continue the private trip to the Sera Monastery, one of the renowned Tibetan Buddhist temples of the Gelug Sect (Yellow Hat). Then visit the Norbulingka Park, a large and beautiful artificial garden. Today's visit starts from the well-known Potala Palace. Built in the Tang Dynasty, it witnessed the great changes and development of Tibet during the past 1,300 years. The palace is composed of two parts, the Red Palace as the center and the White Palace as the wings. The White Palace is the sitting room of Dalai Lamas where there are a variety of halls and corridors, delicate Buddhist paintings and decorations. The Red Palace is the holy place to worship the Buddha. 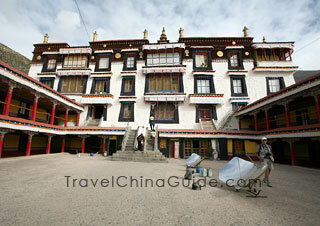 Then you will visit the Tibet Museum to learn more on the local culture and history. You will be impressed by the exhibition of these Buddhist scriptures and statues, ancient books, handicrafts and scroll paintings. After lunch, visit the Jokhang Temple, which was built in the Tang Dynasty and restored and reconstructed many times in the following 1,300 years. Now it has become a huge complex with the architectural styles of the Tang Dynasty, India and Nepal. Then walk along the thriving bazaar of the Barkhor Street, where you could found ancient buildings and temples, local snacks, famous restaurants and various handicrafts. You will then pay a visit to a Nunnery, a very special and spiritual place. We will drive you to Gyangtse today. En route, stop off at the Yamdrok Yumtso Lake, which is the largest inland lake at the north foot of the Himalayas. Known as “Swan Lake” in the local language, it boasts charming landscape of crystal water, green meadow and snow-clad mountains. Arrive at Gyangtse and have a short rest in the best local hotel. You will continue to visit the Palkhor Monastery. The temple plays an important role in Tibetan Buddhism where the three sects - the Gelug Sect, the Sakya Sect and the Bkav-gdam Sect coexist with each other harmoniously. 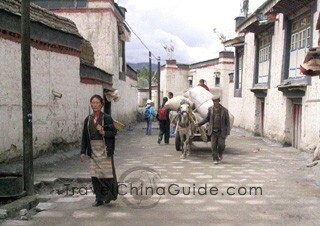 Then take a stroll along the peaceful Gyangtse Old Street, where you can see the old-style houses build with cow dung. This morning, about one hour's drive will take you Shigatse. After checking in the best local hotel and have a short rest, you will visit the largest temple in Shigatse area, Tashilhunpo Monastery, which earns its reputation for the splendid Tibetan Buddhist buildings with brilliant murals and delicate Buddhist statues. Not far from the Tashilhunpo Monastery, you will come to the New Palace of Panchen, which houses many precious historical items about Tibetan Buddhism. Today we will drive you back to Lhasa and transfer you to the hotel. Tibet is a vast land permeated with mystery and national characteristics. It takes longer to transfer from one place to another, so you will spend a lot of time on the vehicle if you explore further. But enjoy the fascinating natural scenery along the way should make for a pleasant journey. Today we will transfer you to the airport for your flight home and conclude the one week private Tibet tour. Have a nice trip! Do a couple (husband & wife) need to bring extra/more Oxy ? It depends on the physical condition of each person, so there is no fixed standard for reference. I kindly suggest you keep warm and prevent from getting cold during your trip in Lhasa. What's more, as I know there are local pharmacies in Tibet sell oxygen, you may ask your tour guide to accompany you to buy. But if you have severe altitude sickness, you should go to the hospital in time. It is a very long train ride and I’m not sure how the kids will do. Is there an option to do the train ride part of the way and fly the other part? Is the entire train ride very scenic? 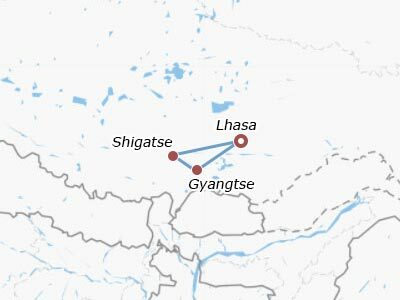 The train from Lhasa to Xi'an takes about 33 hours. It is quite a long time. Your children may feel bored for such a long journey. To save the time, you may consider to take the soft sleeper train from Lhasa to Xining(about 21 hours) and then take the high speed train from Xining to Xi'an(about 4.5 hours). Can we visit Lhasa on our own? Foreigners are not allowed to visit Tibet on their own. 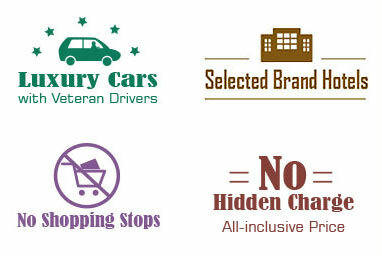 You should find a travel agent to handle your Tibet tour from the airport pick-up until the see-off service. I am a indian student in Xuzhou,Jiangsu. Can i go to lhasa my own as a tourist? I've heard that foreigners must have to go to there with tourist package only. Is it true? As far as I know, foreign tourists are not allowed to enter Lhasa on their own. You will have to take tour with an agency if you want to travel there. 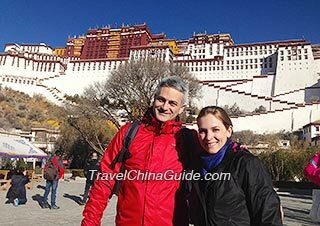 Hi, I am from Egypt and I am very interested in visiting Tibet and specially the "Devout Buddhist Tour" but i don't have a group to travel with. Is it possible to apply for a visa as an individual and get an approval. It's one of my dreams to go there. Please advise. According to the latest news, you can apply for the permit as an individual, but the permit should be applied at least 10 days before your entry and the international bank transfer receipt to Tibet local agent will be needed. For details, I suggest you contact with the company and they will help you on this.